This is my sixth annual forecast of the S&P 500 Index return for the year. It is based on the simple linear regression model. The model uses Gross Domestic Product (GDP) as explanatory variable to the performance of the S&P 500 Index. 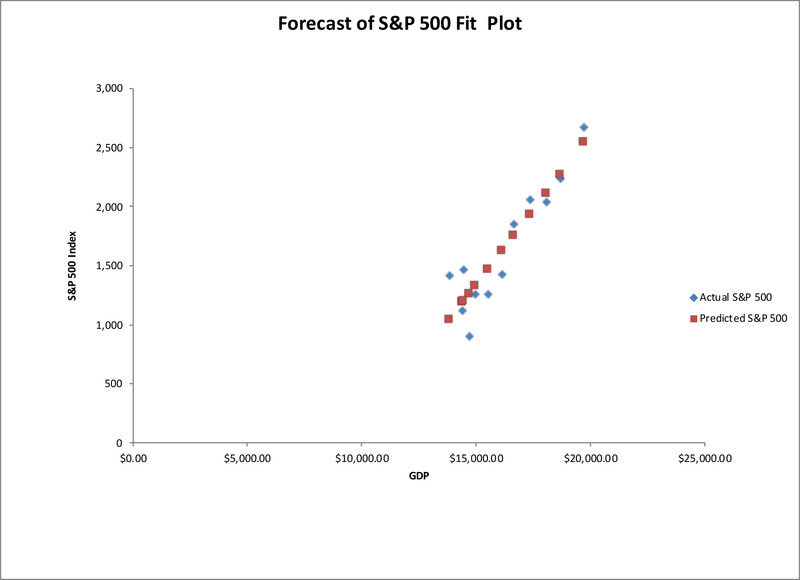 The model predicts the S&P 500 Index to closed at 2,759 at the end of the year 2018. This represents the return of 3.2% for the year. During the last five years, the model proved to predict the direction of the stock market performance correctly. Each year, the model correctly projected up and down markets (see table 1). However, the expected performance for the S&P 500 Index had a wide deviation from the actual index each year. The accuracy of the forecast is not precise (see chart 1). The model draws the best fit line among historical observations. This line may not provide exact guess for where the stock market will be in the future, but it may provide a good estimate for the direction and approximate reasonable range based on the economic growth. For example, in 2017, the S&P 500 index was up 19.4% vs. expectations for 6.1% return. Last year was unusual and difficult to predict, pro-growth tax reforms and favorable monetary policies with low interest rate environment fueled amazing stock market rally. Some of the increase in the stock prices is forward looking with expectations for the economy to do exceptionally well in 2018. Because of the remarkable bull market in 2017, the stock market performance is likely to be subdued in 2018 despite strong economic growth. The stock market is forward looking and reflects expectations in the future. Now, let’s forecast where the S&P 500 Index will close one year from now, on December 31, 2018. Based on the statistical analysis and the process described further in this article, I expect the S&P 500 Index to close between 2,736 and 2,781 at the end of 2018. Based on this range, the midpoint for the S&P 500 Index is predicted to be at 2,759 on December 31, 2018. That is a potential annual upside of 3.2% from the close price of 2,673 on December 29, 2017. This prognosis is based on expected Gross Domestic Product (GDP) of the United States in nominal terms, current USD terms. First, I will take a look at the most recent GDP number. It will be the base from which I calculate the expected nominal GDP. According to the Bureau of Economic Analysis, the current dollar GDP was $19,738.9 billion in the fourth quarter of 2017 (January 26, 2018). According to the economic projections of Federal Reserve Bank Board Members and Federal Reserve Bank Presidents made in December 2017, the real GDP is expected to increase between 2.2% and 2.8%, and Personal Consumption Expenditure – between 1.7% and 2.0% for the year 2018. As a result, the nominal GDP estimated to rise between 3.9% and 4.8%. By multiplying the current dollar GDP for the fourth quarter by expected nominal change for the year, I calculate the GDP for the year 2018 to be between $20,507.78 and $20,685.42 billion. Now I can forecast where the S&P 500 Index will close at the end of 2018. 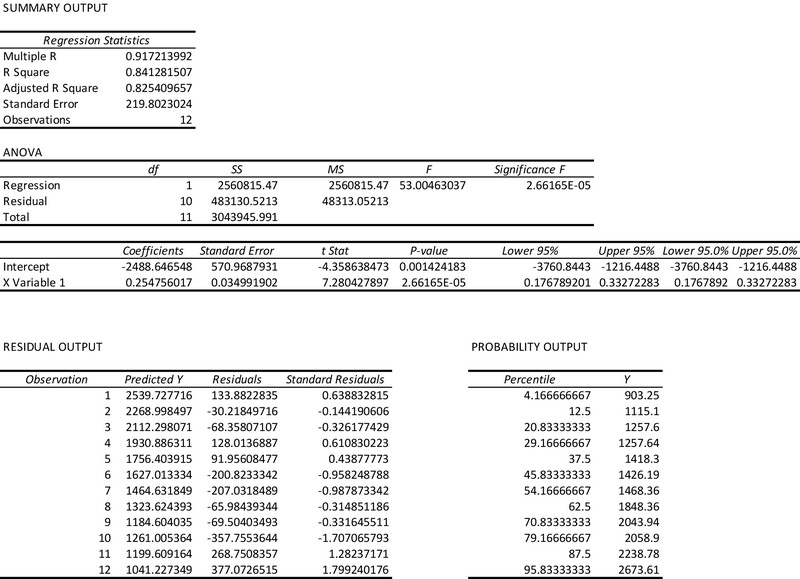 I am using the Excel spreadsheet to run a linear regression model where the S&P 500 is a dependent variable, and GDP is the independent variable. 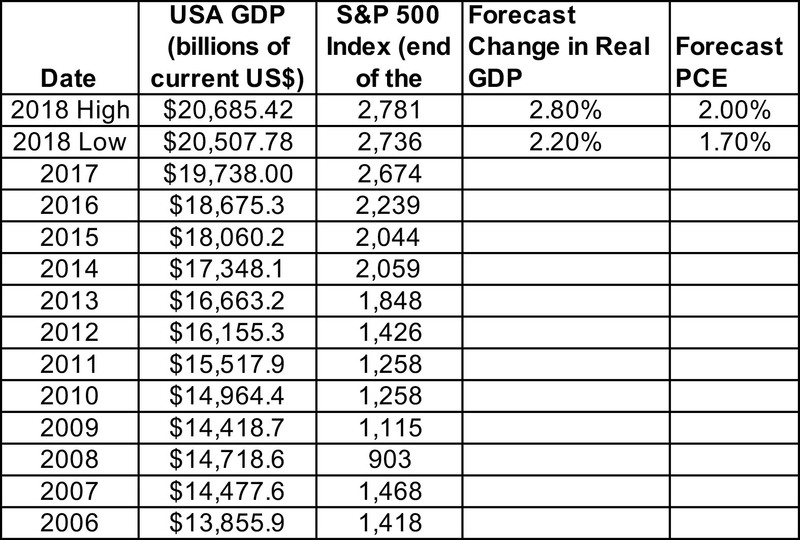 Based on the last 12 years of annual data, I forecast the S&P 500 Index to close between 2,736 and 2,781 at the end of 2018 (see table 2). Based on my prior research, the GDP alone can only explain between 67%-89% of the performance in the S&P 500 Index (see my prior articles on http://www.ecnfin.com). The remaining 11%-33% is not influenced by the GDP growth. There might be other factors that are difficult to predict; such as, geopolitical risk, rise in inflation, and black swan events that nobody expects. By using a smaller sample of data, I am able to focus on the current economic environment. This may not prevent the forecast error because the model does not incorporate information from historical economic cycles.